* Dancers from the festival (Sai Mayur) perform with The Cavern Club at the Yellow Submarine statute outside Liverpool John Lennon Airport. Llangollen International Musical Eisteddfod has announced that the world’s most famous music club, The Cavern, will host its first ever pop-up stage at this year’s festival. The Liverpool-based music venue will be joining bands including the Kaiser Chiefs at the festival’s finale party, Llanfest, on Sunday 8th July, as the date also marks the 50th anniversary of the Beatles’ animated film Yellow Submarine. This collaboration on the Lindop Toyota Globe Stage will see The Cavern Club entertain audiences with performances by their world class resident musicians. The legendary club has been the beating heart of Liverpool’s iconic music scene for over seven decades and will celebrate The Beatles pop history at the festival - hosting a myriad of music performances by world class singers from Liverpool. The International Eisteddfod has been promoting peace and goodwill through music and performance for over 70 years. It even helped launch Luciano Pavarotti’s career and attracts over 4,000 performers and as many as 50,000 visitors across the week. Chairman of the Llangollen International Musical Eisteddfod, Dr Rhys Davies, said: “The International Eisteddfod was created to heal the wounds of war and bring communities from across the globe together through music and dance, in the spirit of international friendship and peace. Director at The Cavern Club, Bill Heckle, said: “We’re thrilled to be working with the Llangollen International Musical Eisteddfod, both by hosting The Cavern’s pop-up stage at this year’s festival and commemorating the Yellow Submarine’s 50th anniversary, which has influenced music and popular culture for half a century. 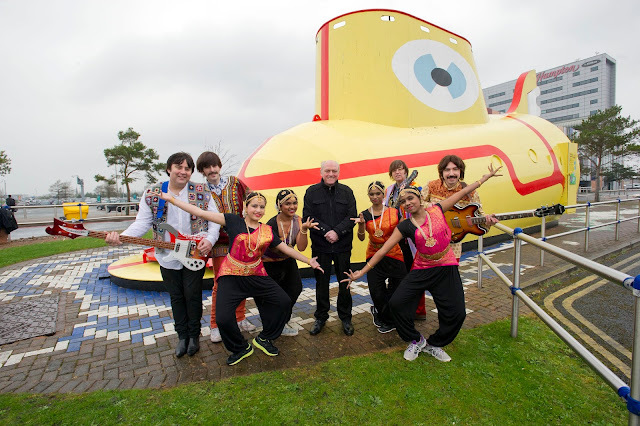 To celebrate their collaboration, international dancers from the festival (Sai Mayur) performed with The Cavern Club at the landmark Yellow submarine statute, outside Liverpool John Lennon Airport. Launched in 2011, Llanfest was introduced as the finale party of the International Eisteddfod, to reach out to new audiences and attract festival goers from across the country. The announcement of The Cavern Club and Kaiser Chiefs 2018 appearance follows the huge success of Welsh band Manic Street Preachers, who raised the roof of the Royal International Pavilion at the festival finale last year.